Atherosclerotic Plaque Characterization Methods Based on Coronary Imaging provides a complete review of computer methods for atherosclerotic plaque reconstruction and characterization. The authors, with their expertise from biomedical engineering, computer science, and cardiology, offer a holistic view. The focus of the book is on the presentation of major imaging techniques, including their limitations. It includes details on the mechanical characterization and properties of plaques and appropriate constitutive models to describe the mechanical behavior of plaques. The authors explore the challenges of using multiple coronary imaging technologies, and provide the pros and cons of invasive vs. non-invasive techniques. Methods for plaque characterization and 3D reconstruction of coronary arteries using IVUS, OCT, and CT images are described. 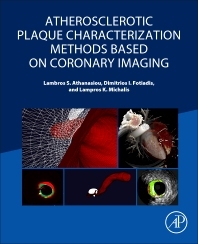 This book will help readers study new trends in image processing analysis and plaque characterization, implement automated plaque characterization methodologies, understand coronary imaging drawbacks, and comprehend 3 dimensional coronary artery and plaque reconstruction methods. 6.5 Can CTA plaque characterization accuracy be affected? Lambros S. Athanasiou received his diploma degree from the Department of Information and Communication Systems Engineering, University of the Aegean, Greece, in 2009 and the PhD degree from the Department of Materials Science and Engineering, University of Ioannina, Greece, in 2015. He is currently working as a Postdoctoral Research Fellow at the Institute for Medical Engineering & Science, Massachusetts Institute of Technology, Cambridge, MA, USA. His research interests include medical image processing, biomedical engineering, decision support and medical expert systems. Dimitrios I. Fotiadis received his Diploma degree in chemical engineering from National Technical University of Athens, Athens, Greece, in 1985 and the Ph.D. degree in chemical engineering from the University of Minnesota, Minneapolis, MN, in 1990. He is currently Professor at the Department of Materials Science and Engineering, University of Ioannina, Greece, and affiliated researcher at the Biomedical Research Dept. of the Institute of Molecular Biology and Biotechnology - FORTH. He is the Director of the Unit of Medical Technology and Intelligent Information Systems, Greece. He is the member of the board of Michailideion Cardiology Center. His research interests include modeling of human tissues and organs, intelligent wearable devices for automated diagnosis and processing/analysis of biomedical data. Lampros K. Michalis received his M.D. degree with Distinction from the University of Athens Medical School, Greece in 1984 and in 1989, he was awarded his M.D. Thesis with Distinction also from the University of Athens Medical School. He has been fully trained in clinical and interventional cardiology in the United Kingdom. Since 1995 he has been with the University of Ioannina Medical School, Ioannina, Greece, where he is a Professor of Cardiology. He is the chairman of the board of Michailideion Cardiology Center. His research interests focus on interventional cardiology, vibrational angioplasty, intravascular imaging, coronary and peripheral artery disease, and bioengineering.